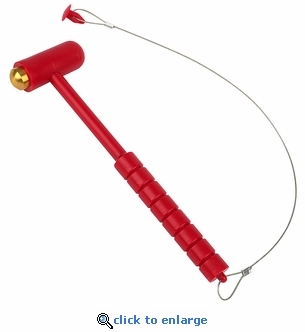 This red replacement break glass striker hammer comes with a braided metal cable to attach to the extinguisher cabinet. This plastic striker hammer with brass striker head is ideal for emergency use to break either glass or acrylic window panels on fire extinguisher cabinets. Breaker hammer for glass or plastic fire extinguisher panels. Plastic hammer & steel cable. Includes plastic snap plug to secure to side of FireTech cabinets.